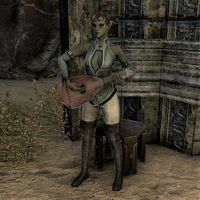 Adrullu Serano is a Dunmer bard located near the Everwound Wellspring. You'll find her playing her lute in the pavilion at the western end of the causeway to the small audience of Sadryn Helbathil. She cannot be interacted with and has no unique dialogue. This page was last modified on 20 June 2018, at 02:05.